"Leixen, the same company that introduced the VV-898S BackPack radio, has once again introduced a product that is like no other out there. A 25W air-cooled handheld portable mobile. 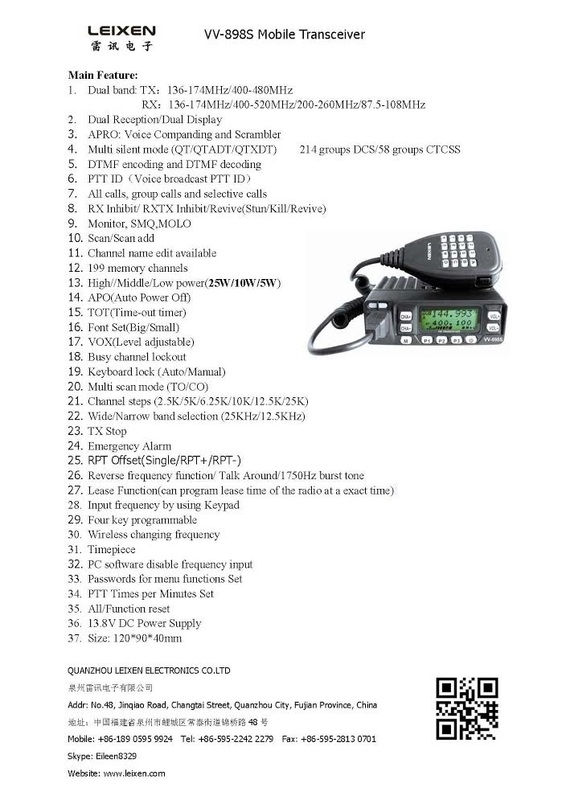 The NOTE is a 16 Channel UHF transceiver, the likes if which I have never seen before. The description is not an error. 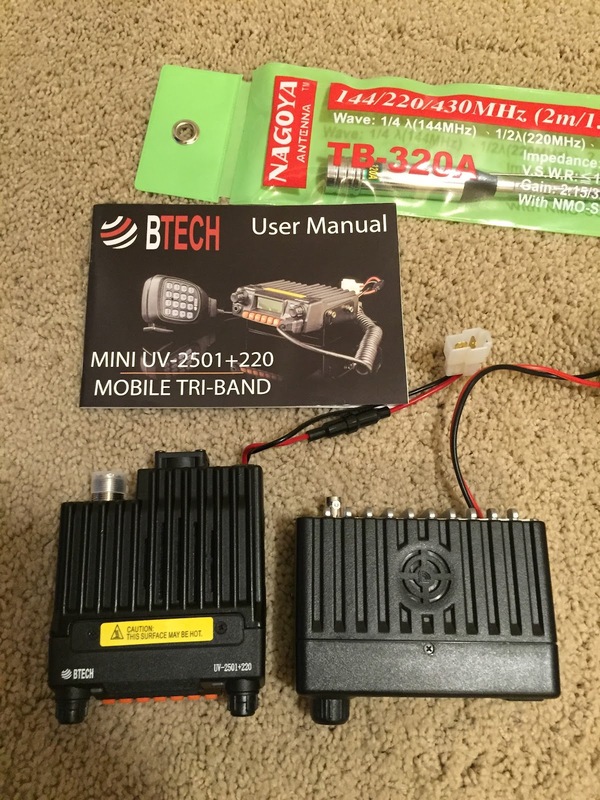 This is a dual purpose tri-power radio that can serve as a 5W/10W handheld, or a 25W mobile all in one package." "A note of caution regarding the radios power. 25W is a lot of RF power. It makes for an incredible radio, but that type of power must be used responsibly." 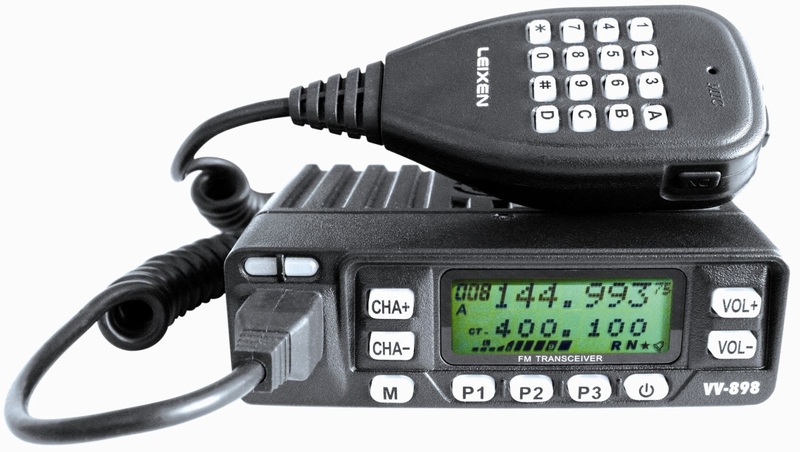 "If you are looking for a single band UHF transceiver that can be used as a base station, mobile, or handheld, the Leixen NOTE is definitely a radio to consider. 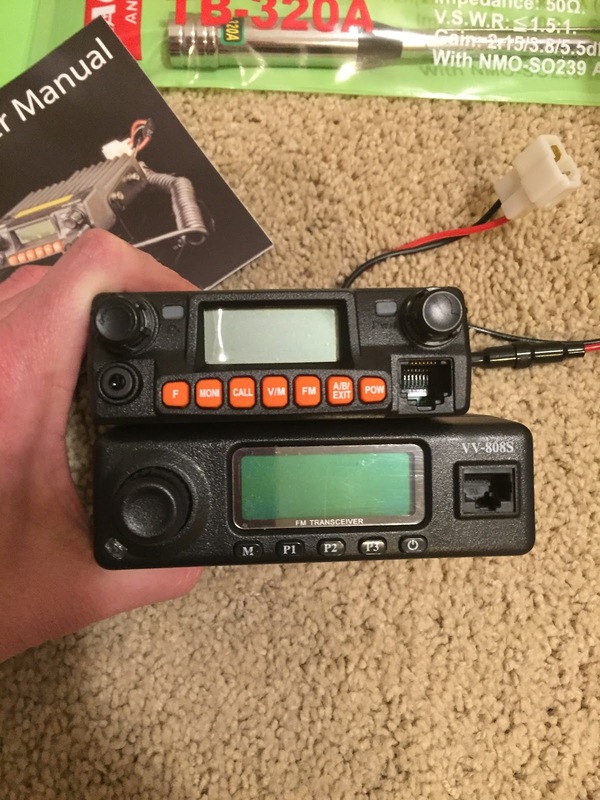 The manufacturer's intent is to eventually produce a similar VHF version." "From the beginning, many hams suggested using the VV-898 in a go-box. Apparently Leixen caught wind of this idea, because they did just that, with the launch of two new variations of this micro mobile, the Leixen VV-898P and VV-898SP UHF/VHF Dual Band Mobile Backpack Two Way Radio." "The VV-898 Backpack Radio is mounted in an enclosure with everything needed to function as a battery powered mobile device capable of instant-on operation virtually anytime, anywhere. It has a rechargeable Li-Ion battery designed for extended periods of operation and a radiator fan with and on/off switch to keep it cool while transmitting out in the field. While it does use the 400mW speaker already built into the radio, a speaker jack is located on the side of the unit for more flexibility and external audio configurations. It includes a 13.8v AC adapter to recharge the battery or to power the radio when used as a base station." 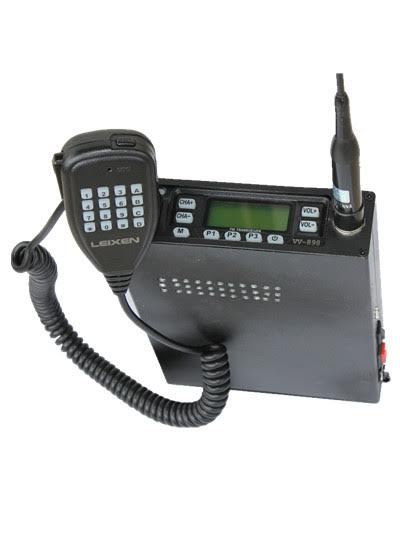 "Like the stand alone mobile versions, the VV-898 backpack radios are available in two models. Leixen VV-898P - This is the 10W model. It has a 6A Lithium-Ion rechargeable battery. Price: $159.99. Leixen VV-898SP - This is the 25W model. It has a 10A Lithium-Ion rechargeable battery. Price: $179.99"
Leixen VV-898: What's it good for? "The Leixen VV-898 seems like a plain, low power unimpressive little radio, but it really does have a lot to offer. Is it a 125W PEP powerhouse Icom mobile or a feature rich Wouxun KG-UV920P-A? Of course not! Considering its small size, weight and unassuming looks, when you take a closer look at the Leixen VV-898, in some ways it seems even better." I'm slow, but MTC has the VV-898 for $59.99. Next up from Leixen is the VV-898SP (25W) and VV-898P (10W) manpack/backpack/piggy back radio. "The receiver is sensitive, very sensitive. With an average sensitivity of -127dBm the Leixen is amongst the most sensitive radios around. Sensitivity isn’t everything though; the capability to separate wanted signals from unwanted signals is much more important. That proved to be something the Leixen VV-898 can’t do at all. Even on a relatively deaf antenna, a Diamond discone, I heard mixer products and out-of-band signals all over VHF and UHF." "It gave an error on FM radio frequency despite you change it or not. It was a MODAL ERROR so you had to kill the program and never send the info to the radio. It has something to do with "." PERIOD and "," COMMA in regional settins being different from chineses. I have had the same problem with Windows7 Spanish and WindowsXP English. Now it works. Note that the date of the downloadable file has changed but it keeps th same version and release numbers." My daughter and I took a quick trip to the Knoxville HamFest. It was her first one. We went late, so I missed what I heard was a good bone yard. I'll post a couple of pictures and more later, but I will say I was a little surprised to see a Leixen VV-898. I screwed up the link when I posted about the cable. I fixed it on the original post but am posting again. Sorry! You can now order the Leixen VV-898 dual-band 10W mobile from AliExpress for $159.00. 1. Maybe many people ask me what is the difference between VV-808S and the old version VV-808. To be honest, it is just update some bugs and add some functions. It make the radio more convenience for use. 2. Please don't disassemble the radio yourself even if you are a seasoned ham, because you might broken the radio in accident. And you won't entitled for the after service since you disassemble the radio.